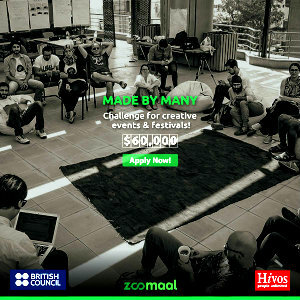 Hivos, in partnership with the British Council, is proud to announce Zoomaal’s launch of the ‘Made-by-Many’ Challenge to support creative and cultural events and festivals that have a social or economic impact with an innovative twist. Events and festivals from Lebanon, Jordan, Syria, Palestine, Iraq, Egypt, Libya, Morocco, Algeria, Tunisia, and Yemen now have the chance to receive part of a $60,000 matching fund, presented by our partners, to encourage collaboration between various stakeholders in the creative, cultural, and innovation sectors, as well as cross-sectoral and inter-regional collaborations. This challenge is targeted at initiatives that work on connecting creative and cultural players, with the aim of establishing stronger ties between NGOs, businesses, national and international bodies, artists, and entrepreneurs. The Open Call for project submission runs from April 17 until May 11, 2015. All projects will go live on Zoomaal on May 25, 2015. Qualifying projects will have to attend a Webinar about crowdfunding and how to create a successful campaign. Zoomaal is the leading crowdfunding platform in the Arab World with the core mission of supporting Arab Creativity. Zoomaal is a pan-Arab initiative by four major institutional investors in the MENA Region. Through the Mideast Creatives programme, with which we support Zoomaal, Hivos aspires to foster a sustainable cultural and creative sector in the Arab region by providing support to collaborative workspaces, setting up training programmes for entrepreneurs in the aligned industries and improving their access to finance.